Carbon plate steel’s main interstitial alloying constituent is carbon, which explains the name. It is provided at different concentrations. As carbon percentage content increases, steel has the ability to become stronger and harder through heat-treating. High carbon steel is very sturdy. Low carbon steel is more malleable and ductile and is easier to cold form. Leeco Steel stocks a solid inventory of low/high carbon, non-structural steel plate at all its distribution centers. 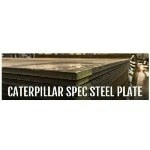 A830-1045 - High-Carbon A830-C1045 steel plate is of structural quality grade plate.